The Wild Coast is one of South Africa's most remote stretches of shoreline. 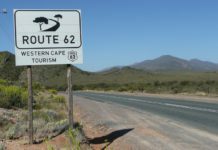 Stretching from East London in the Eastern Cape all the way north to Port Edward and the southern border of KwaZulu-Natal, the region is home to some of the most beautiful coastal scenery in the world. 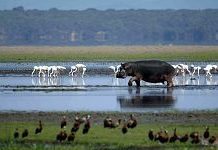 The iSimangaliso Wetland Park is one of the jewels of South Africa's coastline, with a unique mosaic of ecosystems - swamps, lakes, beaches, coral reefs, wetlands, woodlands, coastal forests and grasslands - supporting an astounding diversity of animal, bird and marine life. 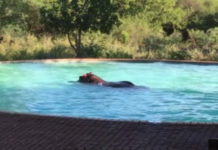 A hippo in South Africa's drought-hit Limpopo province decided to cool off in the swimming pool of a private nature reserve. 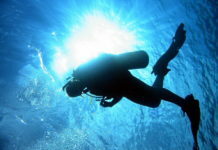 Staff recorded a short video clip of the quirky incident before gently guiding the animal out of the pool using pool brushes and leaf catchers. 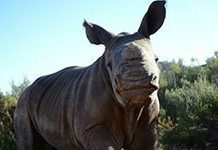 A rhino calf, found abandoned on New Year's Eve in South Africa's Aquila Private Game Reserve, has been named following a public vote. The names suggested were shortlisted to six, but Osita, a name of Igbo origin, won the hearts of most of the voters. 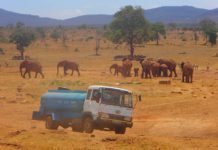 Conservationist and head of iSimangaliso Wetland Park Andrew Zaloumis has been awarded World Wildlife Fund South Africa's 2015 Living Planet Award for his inspirational conservation work and his role in the economic turnaround of the prestigious KwaZulu-Natal nature reserve. 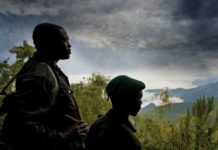 A professional photographer got lucky when he was on safari in the Kruger National Park. 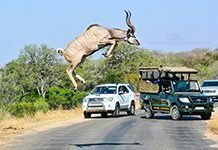 Arno Pietersen managed to capture a magnificent jumping kudu bull and the images have left an impression on those who have seen them.